In space, no one can hear you scream. But can they hear you bellow abuse down your microphone at a camper who’s just killed you for the 10th time? We’ll find out when Call of Duty: Infinity Warfare, which – as has been rumoured for a while – is set in space, is released on 4th November. Infinity Warfare places you in the combat boots of a soldier in a distant future where Earth has been depleted of its natural resources and humanity relies on space colony production instead. Unfortunately, an evil group of terrorists, the Settlement Defence Front, has started capturing colonies and plan to invade Earth next. Step forward, you. From the trailer, which was launched earlier this week, Infinity Warfare looks like a combination of classic COD gameplay and modern sci-fi shoot-em-ups. In fact, quite a few scenes look like they’re straight out of Halo, with huge Covenant-style ships filling the sky. As well as epic ground battles, you’ll also be able to command your own space jet. Star Fox style dogfights will apparently play a big part in the game, although you’ll also be able to exit your jet and engage in some zero-G fighting action; one scene from the trailer shows some poor chap getting his oxygen tank ripped from his face in the middle of space. We also know that a huge space ship, the USNA Retribution, will act as ‘the hub’ of the game. From here, you’ll be able to tackle missions in an order of your choosing. There are very few details on multiplayer yet, although we’re willing to bet that some maps will be set in space. We’re also willing to bet you’ll be able to commandeer jets on larger maps, like Battlefield. We do know that Zombies will be making an appearance though, the first time it’s appeared in an Infinity Ward Call of Duty game. There’s no word on whether the mode will feature space zombies, but we’re keeping our fingers crossed. There’s bad news for Xbox 360 and PS3 owners, however; for the first time, Call of Duty won’t be released on either console. It really is time to upgrade! Call of Duty 4: Modern Warfare Remastered! Yep, Activision is remaking the game that turned Call of Duty into the ridiculously popular money-making machine it is today. The remaster will include a reworked version of the original campaign, which saw rookie soldier Soap McTavish save the world with the help of his boss and good pal Captain Price. Based on early impressions, everyone’s favourite moustachioed killing machine looks better than ever. It will also include 10 multiplayer maps from the original game, including Crash, Backlot and Crossfire. Although nothing has been confirmed, there is a chance the rest will be released as DLC. There is a catch, however; Modern Warfare Remastered will only be included with the Legacy Edition of Infinite Warfare. You won’t be able to buy it separately, and it won’t be bundled with the standard edition of Infinite Warfare either. 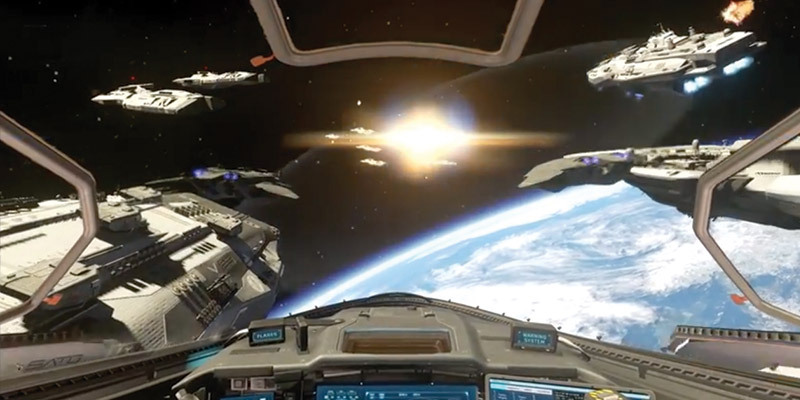 What did you think of the Infinite Warfare trailer? Are you looking forward to it? And how hyped are you for Modern Warfare Remastered? Let us know in the comments! If you’re planning to buy Infinite Warfare, why now start saving by selling games with musicMagpie? It’s as easy as getting an instant price, packing your games into a box and sending them for FREE. We’ll then pay you the same day your stuff arrives! Just click below to start selling. If you can’t wait for Infinite Warfare, revisit the rest of the series on the musicMagpie Store – it’s one of the best places to buy used games online! ← Get 20% off EVERYTHING on the musicMagpie Store this weekend!